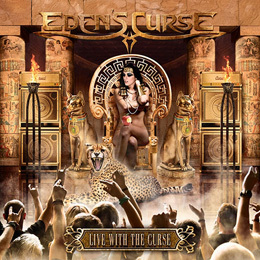 After nine years existence, Eden’s Curse now releases their very first live album, recorded in Glasgow’s Classic Grand on November 28th 2014. Before, they released 4 studio albums that received good reviews. Mixing and mastering of these recordings was handled by none other than Dennis Ward, their longtime engineer. The album clocks of around 100 minutes, and contains 20 tracks in total, among them guitar solo and a band introduction (so to be completely honest, you only get 18 tracks). The sound of the album is pretty good for a live album, Dennis has managed to mix this so that you don’t get the feeling that you can’t hear all the instruments, or that the vocals are washed away by the instruments. As I said, this album contains 18 tracks, taken from the four studio albums this band, who really started as a studio project have released. Despite not being a great fan of live-albums, it was agreeable listening to this double CD. Of course if you start with great studio material, and you can play your instruments, can benefit from a well-versed engineer, you’d have to play your songs backwards so to speak if you really want to ruin your record. A very nice album !